an Actions button to apply modifications to each selected items. The first option of the Actions button is Update. It permits to modify the fields content of the selected items. After the Update entry, we can declare additional specific massive actions for our current itemtype. We can have multiple actions for the same class, and we may target different class from our current object. Besides an instance of MassiveAction class $ma, we have also an instance of the current itemtype $item and the list of selected id ``$ids. 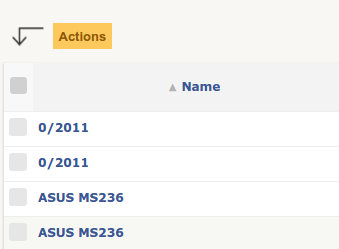 itemDone, indicates the result of the current $id, see constants of MassiveAction class. If we miss this call, the current $id will still be considered as OK.